That's the ruling a judge handed a Central Saanich man in court Tuesday after he pleaded guilty to cranking his car stereo too loud. 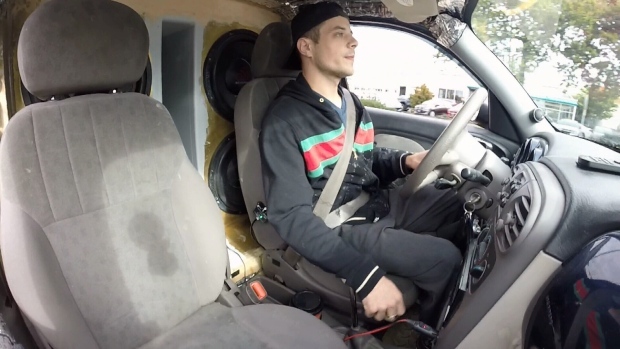 Dustin Hamilton has been the subject of more than a dozen complaints and some in-person altercations over his sound system, which he says can reach levels of up to 155 decibels. The situation started in May 2017 and escalated over several months before police intervened, charging Hamilton with mischief. "The bass level is so loud that their dishes will rattle in the house, paintings or pictures and mirrors on the wall will shake, their young kids are woken up in the middle of the night because of the noise,” Cpl. Dan Cottingham said at the time. In court Tuesday, Hamilton was handed a ban on operating a car stereo in Central Saanich for two years. He has previously said he's never meant to offend anyone with his stereo volume. “If somebody just came up to me nicely saying, 'Hey I live here, this is what’s happening,' you know, we could do that," he said last year. "I never had that, I just had a guy follow me and try and assault me." According to the American Speech Language Association, the impact of 155 decibels is similar to hearing fireworks at just three feet away.